It wasn’t until my children were adults that I finally had the time to ask, “What do I want to be when I grow up?” The answer was easy. With my love for travel and passion for customer service, a career as a travel agent was a natural fit. These days there is nothing I’d rather do than help my clients take the vacation of their dreams. One of the best parts of being a travel agent is becoming a part of the experience, from start to finish. Recently I helped a father book an escorted tour for him and his daughter. It was a surprise for her, intended as a celebratory trip following her high school graduation and he videotaped her as she opened her gift and saw the itinerary. It’s hard to say who was happier, the father, the daughter or me, but it’s safe to say that moments like that one are a big part of why I do what I do. Continuing education is an integral part of being a high-level consultant, and I’m always bettering myself and expanding my expertise so I can craft the most unique trips to a wide range of destinations. My passion for travel and the customer service that every client receives has been one of my best strengths. You’d be hard pressed to find anyone who is more enthusiastic about what they do than I am. From picking a destination to pinpointing each little detail to being available around the clock just in case a problem crops up, I’m dedicated to creating a memorable experience exceeding every expectation, and every time a client returns from a trip and shares a story or a memory or a picture, I get a little thrill. I’d love nothing more than to help you plan your vacation of a lifetime. Your adventure starts now! I will start by saying that I have always loved helping people! And more importantly I love traveling! I obtained my Bachelor’s Degree in Human Development and Family Studies from Michigan State University. I have worked in the customer service field for over 13 years. Including having spent the last 5 years in the Early Childhood Education field running a childcare center. Human interaction is something incredibly important to me and recently quitting my career to work from home made that apparent! I have three beautiful children Tate, Troy, and Scarlett as well as an incredible Husband Kyle who I felt needed my time and devotion. Thus influencing my decision to work from home. This opportunity came to me and I jumped on it! I love helping others and this is a way for me to do it and not sacrifice my family. I am dedicated to success through education and will be there to get the answer to any question you may have if I can not answer it myself. I believe that my business experience, love for people, and impeccable customer service make me a perfect fit to help you book your next vacation! 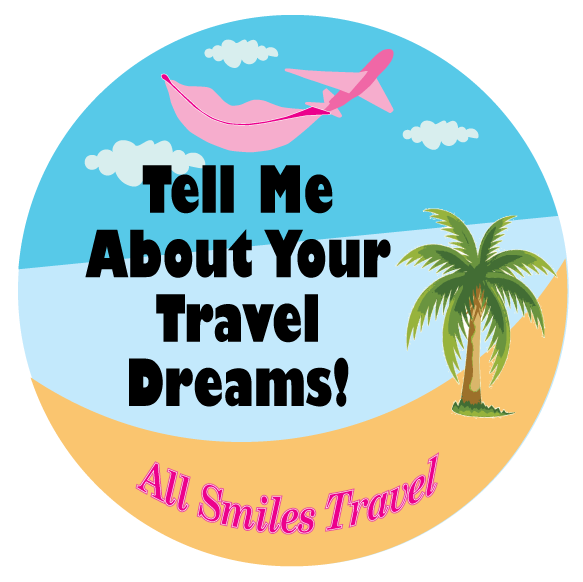 All Smiles Travel is dedicated to offering you the best prices and advice, while maintaining an emphasis on customer service, so don’t hesitate to contact Linda or Rachel so we can start planning your next travel adventure! As your personal Travel Agents, we will devote time and effort to making sure you’re happy with your travel options. If you need any assistance, we are just a phone call or e-mail away, so you’ll receive the immediate attention you not only need, but also deserve.